So the Wikipedia definition of CRM is “an approach to managing a company’s interaction with current and future customers. It often involves using technology to organise, automate, and synchronise sales, marketing, customer service, and technical support”. In plain English, it’s about getting leads, closing deals and putting out customer fires. If we can create systems so all team members can see them in the one place then we have an effective CRM. Sometimes these systems are in different software packages. It’s incredibly costly to build a “one system to rule them all” solution (and I’ve rarely seen successful implementations in the SMB space) so the common solution is to take off-the-shelf solutions and configure them to suit your needs. What is really useful is a framework to know where the pieces fit in this technology puzzle. 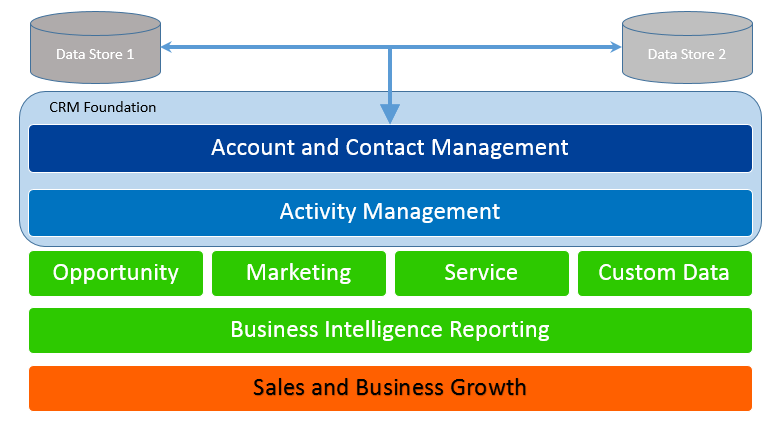 The foundation or core of any CRM system are your customers (account and contact management) and activity management (your staff’s contact related activities). Building on this are: opportunity management, marketing management, customer service management and other custom requirements for your organisation. With accurate data capture, you can then report on this for improved Business Intelligence, helping you make better decisions and build your sales and business growth. A sales team in the customer care division who don’t require access to accounting system can see customer orders in their CRM to view the purchase history. Orders are synchronised daily to their CRM. Regional sales staff use a quoting solution to send their own invoices. Invoices are logged in CRM and an internal order is forwarded for processing by administration team using their accounting system. Using a 3rd party email marketing system, open rates, click through s and unsubscribes are logged into the CRM directly. Using a custom service management tool, key information is displayed in CRM for sales reps to view service issues. Quoting solution, which integrates with CRM, displays up-to-date product and pricing information for sales reps to choose from. Tagged: CRM Strategy, goldmine crm.